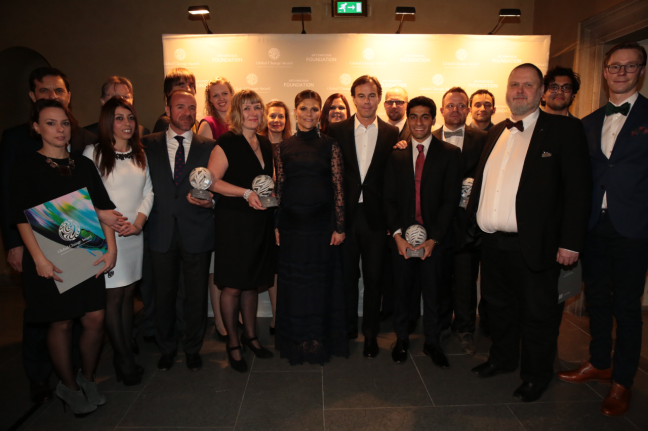 On 10 February, HRH Crown Princess Victoria of Sweden awarded the winners of the first Global Change Award, an annual innovation challenge for circular fashion initiated by the non-profit H&M Conscious Foundation. Most votes, and a grant of €300,000, were awarded to the Finnish team behind Making waste-cotton new; conversion of waste-cotton into new textile. To further accelerate the transformation towards a circular fashion industry, the Foundation now launches the Global Change Award Network, an open-source database for innovations. “This prestigious grant will allow us to lift our technology closer to an industrially viable level. Now we will focus on the further development of technical details, in particular the solvent recovery to ensure economic competitiveness and complete environmental friendliness of our process, says Michael Hummel, spokesperson for the Finnish team behind Making waste-cotton new – conversion of waste-cotton into new textile. Inspired by the response from the global innovation community, and to spark impact beyond the five winners, the Foundation now launches the Global Change Award Network, a public digital space where teams and ideas can grow. “When the application period closed, we sat with thousands of amazing ideas. So we decided to create the Global Change Award Network. You can look at it as a matchmaking site, where innovators can present their ideas, get feedback, make contacts and maybe investors can even find the next big thing. A digital greenhouse for innovative ideas,” says Karl-Johan Persson, board member of the H&M Conscious Foundation and CEO of H&M. The award ceremony on 10 February marked the beginning of a one year innovation accelerator, provided by H&M Conscious Foundation, Accenture and KTH Royal Institute of Technology in Stockholm, Sweden. The program will help the winners develop their ideas, focusing on three main areas; circular economy, innovation and fashion industry connection. “The level of innovation that we have seen throughout this process is truly inspiring and we aim to advance the strategic business growth of the five Global Change Award winners by guiding and coaching them through the Innovation Accelerator to develop their ideas further”, says Jennie Perzon Strategy Program Lead, Accenture. “For KTH, it is a matter of both urgency and privilege to be a partner to Global Change Award, as we are facing extreme environmental challenges. Supporting this effort and being part of a better future is the obvious course for KTH to take. We are excited to kick off the accelerator program and get to know the five winning innovators,” says Lisa Ericsson, Head of KTH Innovation. Download images and short films from the grand award ceremony here (supports Chrome, Safari, Firefox and Opera). The Global Change Award was introduced in August 2015 by the non-profit H&M Conscious Foundation. Between 25 August and 31 October the challenge was open for anyone to apply. Over 2,700 innovators from 112 countries contributed. The H&M Conscious Foundation reviewed the applications with the help of innovation collaborators KTH Royal Institute of Technology, Accenture and the Expert jury. The five ideas considered to have most potential in helping close the loop for fashion was selected as winners. Starting off, KTH Innovation invites the winning teams to a one week intensive immersion program at KTH campus in Stockholm. This will be followed by a one year training and coaching program, provided by Accenture Strategy. The winners will get individual coaching and tailored learning sessions and assignments in order to take their ideas to the next level. Through the H&M Conscious Foundation and H&M, the Innovation Accelerator will also provide exclusive fashion industry access and offer possibilities to build networks and try out the ideas within the fashion value chain. The H&M Conscious Foundation is funded by the Stefan Persson family – founders and main owners of the Swedish fashion company H&M. Since 2013, the family has donated SEK 900 million to the H&M Conscious Foundation. Dr. Michael Braungart: Academic Chair “Cradle to Cradle for Innovation and Quality” at Erasmus University Rotterdam; Professor at Leuphana University Lüneburg; Scientific Director of EPEA Hamburg. Prof. Rebecca Earley: Professor in Sustainable Textile and Fashion Design at University of the Arts London and Director of its Textile Futures Research Centre. Mr. Ma Jun: Director, Institute of Public and Environmental Affairs, China. Ms. Eva Kruse: CEO, Danish Fashion Institute; CEO, Copenhagen Fashion Week. Prof. Johan Rockström: Director of the Stockholm Resilience Centre and Professor in Environmental Science with emphasis on water resources and global sustainability at Stockholm University. Mr. Ellis Rubinstein: President and CEO, The New York Academy of Sciences. Ms. Franca Sozzani: Editor in Chief of Vogue Italia. Ms. Amber Valletta: Supermodel, actress & entrepreneur. This entry was posted in Apparel, Awards, Fashion, Management, Retail, Retailer and tagged Global Change Award, H&M Conscious Foundation, HRH Crown Princess Victoria of Sweden, Jennie Perzon, Karl-Johan Persson, Michael Hummel. Bookmark the permalink.